Learn how to create multi-column layout, navigation bar, carousel, progress bar, popover, form validation and more. Find out how to easily customize Bootstrap to fit your style. Learn by example: all examples are fully tested and downloadable. You can reuse them on your own project. Build a responsive website from scratch - step by step. One of the big challenges in web development is maintaining the site's compatibility across devices and their various display sizes, from desktop computers to tablets and mobile phones. The last thing we want is to have a website that looks good on a desktop but is painful to navigate on a small display, or looks great on a small screen but appears oddly tiny in the center of a large screen. Ideally the site should have the ability to automatically reorganize itself to provide the optimal viewing experience, in accordance with the size of the display. In short, we want our website to be responsive. This is where Bootstrap 3 comes in handy. It makes building responsive websites easier and quicker. Aimed at absolute beginners, this book will not require you to have any experience in HTML, CSS or JQuery. You will learn as you go along. It explains the subject matter in a step by step fashion, with plenty of examples and screenshots to illustrate the points. All examples are downloadable. You can download, tweak and reuse them on your own project. You will not have to to retype everything. If you are able to learn on your own by perusing the online documentation provided by Bootstrap, you do not need this book. Before you open your wallet, check out Bootstrap's official site and give it a go. This book will guide you in transforming a simple HTML page into a responsive one. It will demonstrate how to use Bootstrap's grid system to create a multi-column layout. It will also guide you in creating a navigation bar, different types of menus (with or without dropdowns), buttons, icons, modal and tables. The book will also cover forms and form validations, where you will create a Sign Up page with some validation procedures to examine the data entered and display a warning when appropriate. Needless to say, this book will be incomplete without a lesson on customizing Bootstrap to fit your own style. The book will cover light customization that will illustrate how you can change fonts, colors and background images to make the page your own. Light customization however is good only for minimal changes in the design. To tweak the design further, you will be better off using LESS. Therefore one chapter will be dedicated to demonstrate the customization using LESS. Towards the end of the book, we will throw in some more Bootstrap components that can increase your site's appeal. You will learn about Carousel, Affix, Scrollspy, Tooltip, Popover, Collapse and Progress Bar. Not only you will learn how to display them, you will also utilize some of the controls to make them work. As the last lesson, you will learn how to show or hide certain parts of the page depending on the size of the screen. For the absolute beginners, quick introductions to CSS, LESS and compiling LESS are provided in the appendices. 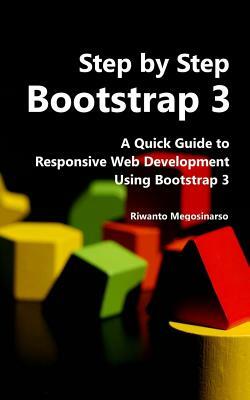 If you are looking for a step by step guide to responsive web development using Bootstrap, you may want to give this book a try.